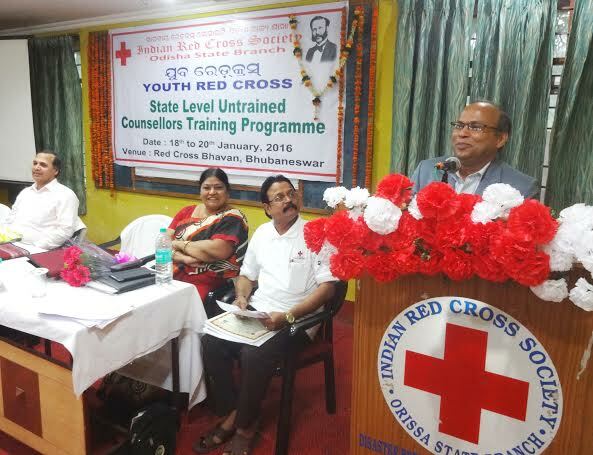 Like previous years practice, Indian Red Cross Society-Odisha State Branch(IRCS-OSB) Youth Red Cross has organised a 03(three) days State level training programme for untrained Youth Red Cross Counsellors from 18.01.2016 to 20.01.2016. The objective of this three days training programme is to acquaint the Counsellors with various activities and objectives of Youth Red Cross with the view to strengthen YRC movement in Odisha. The 3 days State level training programme was inaugurated by Prof. (Dr.) Nihar Ranjan Pattnaik, Director, Higher Education on 18.01.2016. Today, Prof. (Dr.) Basudev Chhatoi, Chairman, Council of Higher Secondary Education, Govt.of Odisha graced the Valedictory of the training programme as Chief Guest. He greatly appreciated the efforts taken by Youth Red Cross in Odisha. He inspired the Counsellors to have commitment for humanitarian service and to organise various YRC Programmes at the college level. Dr. Chakradhar Panda, Secretary, Youth Red Cross, Odisha in his address he encourages the YRC Counsellors to increase their responsibilities towards the Society & introduce various innovative programmes at College level, to channelize the energy of Youth Red Cross Volunteers for betterment of the society. In this 3 days training Programme Youth Red Cross Counsellors trained on the topics such as:- History of Red Cross Movement and Fundamental Principles of Youth Red Cross, Red Cross Emblem and its use, awareness about HIV/AIDS, Functions of Red Ribbon Club, Psychological Support in Disaster Management, Motivation for organising Voluntary Blood Donation Camps, Role of Youth Red Cross in Road Safety, Disaster Preparedness, Disaster Risk Reduction, Climate Change & Environment Protection. The 3 days training Programme was coordinated by Dr. Maj. Kalpana Das, Youth Red Cross Officer and said to the participants, Service to man is service to God and it should be the prime responsibility of ours to provide the humanitarian service to the vulnerable of the society. Besides, at the end of the programme Certificates of participation distributed to all participants by the Guests. Sri Lokanath Mohanty, YRC Counsellors offered vote of thanks and Sri Susil Kumar Pattnaik, YRC Counsellor, Ramadevi (A) College, Sri B. Govinda Rao, YRC Counsellor, Anchalika Science College, Chatrapur, Ganjam & Sri Lingaraj Panda assisted the training programme.